Status: Common regular spring and fall migrant statewide. Locally common regular breeder west and central, uncommon east. Locally uncommon regular winter visitor Platte River Valley, rare elsewhere. Documentation: Specimen: UNSM ZM10615, 24 Jun 1912 Halsey, Thomas Co.
Taxonomy: Currently five subspecies are recognized (Vennesland and Butler 2011), including western North American fannini, northern North American herodias breeding south to the Dakotas, Indiana, and the Carolinas, wardi breeding south of herodias from Nebraska southward, cognata of the Galapagos Islands, and occidentalis of Florida. Most breeding Great Blue Herons in Nebraska, according to Vennesland and Butler (2011), are wardi, although some intergradation might be expected in northern Nebraska. Older records relied on taxonomic assignments that are currently not valid; it has, for example, been thought that Nebraska had only two records of wardi: one collected 18 Aug 1914 at Inland, Clay Co (Brooking, Notes), probably a post-breeding wanderer, and another reported from Frontier Co (AOU 1957). Another example is Swenk’s (Notes Before 1925) report of two specimens of herodias in the Black collection that approached wardi in size, suggestive of some intergradation; under current taxonomy, these were probably indeed wardi. Spring: Most years, wintering birds make spring arrival difficult dates to determine, but there is a noticeable increase in numbers around the spring thaw, typically in late Feb-early Mar. Males arrive early at rookeries, such as those standing on nests at Sutherland Reservoir, Lincoln Co by 26 Feb 2006, Franklin Co by 4 Mar 2012, and Lake Ogallala, Keith Co 6 Mar 2016. Nine at Harlan Co Reservoir, Harlan Co 22 Feb 2004 may have been early migrants. High counts: 85 at a pond in York Co 13 Apr 2018, 50 at Crescent Lake NWR, Garden Co 10 Apr 1996, 50 around Lake McConaughy, Keith Co 13 Apr 1997, and 48 at Crescent Lake NWR 14 May 1995. Summer: This species breeds statewide in colonies containing up to 100 or more nests. A large colony in Dawson Co, near Interstate Highway 80, had 90+ nests 11 May 2002 (Mollhoff 2004), and one in Cass Co had 94 nests 23 Mar 2011. Ducey (1988) indicated breeding records since 1960 in 30 counties statewide. In 2001, at least 20 active colonies were known to be distributed across the state; previously, several were in the Keystone Lake, Lake McConaughy area (Brown et al 1996, Rosche 1994), and, in 1994, Rosche located 9 rookeries with 81 nests in Webster, Harlan, Hitchcock, Cheyenne, Kimball, Sheridan, and Sioux Cos.
A group of seven nests in power transmission lines in Sarpy Co in 2003 was removed due to the potential for the birds’ droppings causing power outages (Omaha World Herald). Entire colonies of incubating adults have been recorded as late as 18-20 Jul, suggesting either late nesting or re-nesting attempts. Fall: In late summer, post-breeding flocks begin to form, probably including birds from further north as well as local post-breeding wanderers. Sixty were counted in the eastern Rainwater Basin 24 Jun 2005, 85 were at Jack Sinn WMA, Lancaster Co 22 Jul 2012, and 125 were along the Missouri River Valley in southeast Nebraska 25 Jul 2010. There is no clear fall movement, although about half of departure dates fall in Oct, and most Great Blue Herons have left the state by mid-Nov.
Returns from juveniles banded in Nebraska indicate that most migrate directly south during winter periods into Oklahoma, Texas and Mexico. High counts: 160 at Harlan Co Reservoir 20 Sep 2001, 119 at Lake McConaughy 20 Sep 1998, and 102 there 16 Sep 1983. Winter: Although there are winter records statewide, overwintering is essentially limited to the Platte and North Platte River Valleys. Regular sightings occur near Lewellen and below Keystone Lake along the North Platte River (Rosche 1994), where 17 were present 1 Jan 2017, and 15 on 29 Jan 2000; 15 were at nearby Sutherland Reservoir, Lincoln Co 2 Jan 2015. During periods of severe winter weather, all birds probably leave the state. 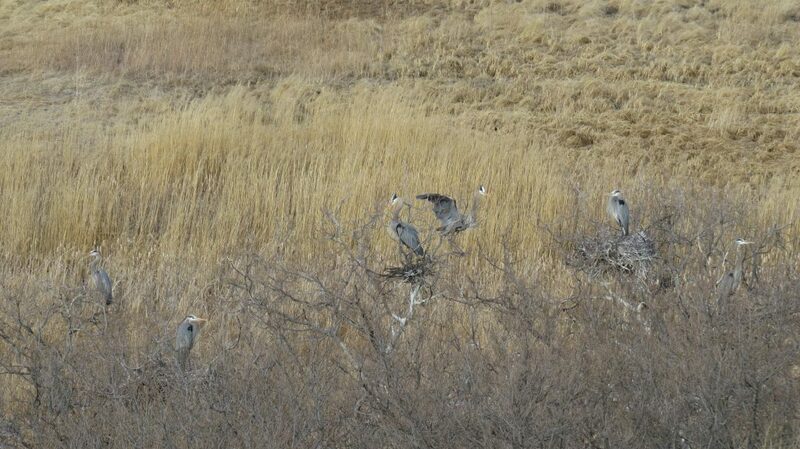 Great Blue Heron rookery at Cottonwood Steverson Wildlife Management Area, Cherry Co 21 Apr 2014. Photo by Joel G. Jorgensen. Photograph (top) of a Great Blue Heron (location and date unknown) by Chris Masada and provided as a courtesy of NEBRASKALAND/Nebraska Game and Parks Commission. American Ornithologists’ Union [AOU] . 1957. The AOU Check-list of North American birds, 5th ed. Port City Press, Baltimore, Maryland, USA.